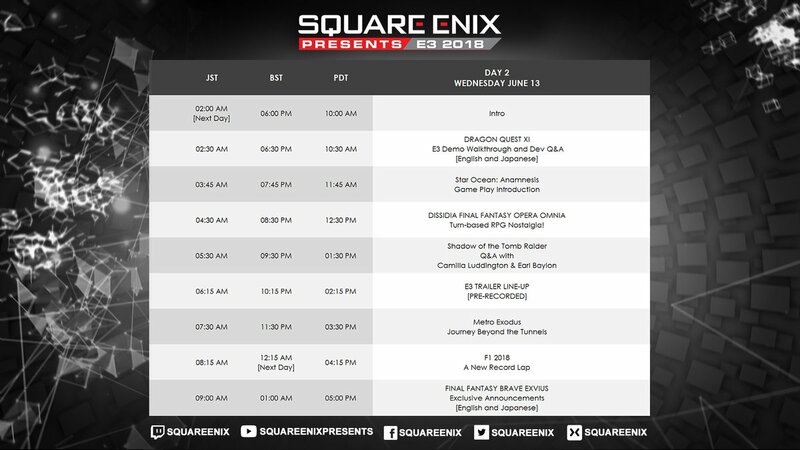 With E3 now officially underway, Square Enix has announced their lineup of games and special events taking place at booth #1601 in the South Hall of the Los Angeles Convention Center. Attendees will get a first look and even a chance to play some of Square Enix’s new upcoming titles; such as The Awesome Adventures of Captain Spirit, Dragon Quest XI: The Echoes of an Elusive Age, Shadow of the Tomb Raider, Just Cause 4 and long awaited Kingdom Hearts III. Final Fantasy XIV is also in attendance, and have recently announced a special upcoming crossover event with Capcom’s Monster Hunter: World. 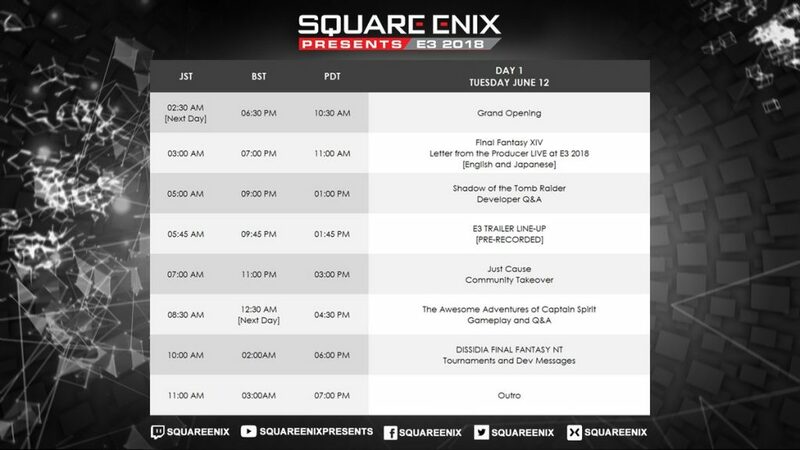 Square Enix is also hosting it’s live online broadcast “Square Enix Presents” directly from their booth. So fans from all over the world can also get a closer look at the upcoming titles showcased at E3, and will even have the chance to interact with creators throughout the streams. You can view the stream on their official Twitch channel and Youtube. 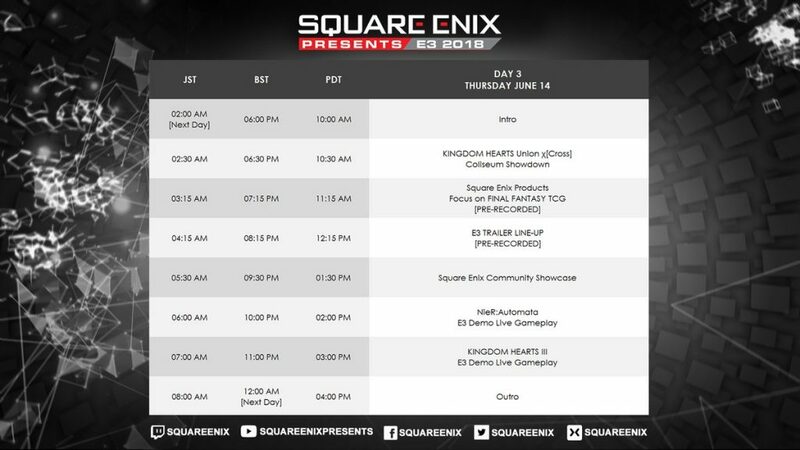 Square Enix will also be hosting a series of panels at the E3 Coliseum, providing an in-depth look at the latest game developments and updates. The development team in attendance: Jill Murray (Lead Writer), Darryl Purdy (Performance Director), and special guests Camilla Luddington (performance artist for Lara Croft) and Earl Baylon (performance artist for Jonah Maiava). The panel will be moderated by Meagan Marie (Senior Community and Social Media Manager). Attendees can also stop by booth #2313 in the South Hall to visit a pop up Square Enix shop, where select products will be available for purchase. Fans can also try their hand out in the Final Fantasy Trading Card Game Sealed Deck and Starter Deck Tournaments, which will offer both free-form play with a beginner’s tutorial alongside more advanced “Gunslinger” style matches. For more information, you can check out their official E3 website. For E3 coverage of all things Square Enix, be sure to check out our previous articles and keep an eye on our twitter for latest updates and news! Posted in E3 2018 and tagged E3 2018. No FF7R. At this point they might as well leave it too PS5. While dissapointed with the lack of content and specifically no ff7 remake news, it kinda makes sense that they want to hype up the anticipation for KH3 right now. Showing a new ff7 trailer would probably put a bigass shadow over Kingdom Hearts. Of course this is just speculation but once the release is over and done with I got a feeling that the floodgates on the remake are gonna open up for reals. SE were the disappointment of E3 this year. No show in 3 years, make a big thing about having their first show in 3 years, then make it a quick half hour(ish) video of trailers for games we’ve already seen or reveals that happened the day before at the Microsoft showcase. It was going to be touch and go whether they showed anything from the FF7 Remake, but I’m not fussed either way, would have been nice but they want the spotlight on KH3 for now. Great, we’ll get some more KH3 news. Big trailers, lots of info, something substantial. No, just 3 poorly edited trailers over the Microsoft, SE and Sony shows. FFXIV pops up, no this is a Stormblood trailer for patch 4.3, which is already out. Maybe something for FFXV for the coming year of DLC, they wouldn’t scoff at a chance to slip FFXV in there and show it off, god knows they’ve been doing it at every opportunity the past year and a half anyway…no not a sign of anything XV related. I don’t want this to sound entitled, I wasn’t expecting anything specific or have a list of demands I wanted, but I did expect *something*. Their presence this year was pointless, a complete damp squib. On the other side: no show in 3 years, than hyping us, and than a presentation like this with mostly trailers of games we knew where comming anyway is very uncool, even if you take into account the nice KH III trailer. Is going to be final fantasy versus 13 again. Do see your Point. What i’m gettin at is that the whole internet seems to go rage mode on squenix for not showing anything from ff7remake. Tbh let’s say you are Nomura and you have worked on KH3 for all those years and now you let loose the Disney decorated hype train, now let’s say you release a new ff7 trailer at the same time. It will basically result in everyone wondering why they should get on the train when there’s another one on the next platform looking even nicer? 2015 was three E3’s ago, and that’s worrying. I love Cloud in Smash Bros! There is no release date, that’s just an estimate ( and a strange estimate, as usually it’s always Dec 31st. for games that don’t yet have release dates ) FFVII’s been available for Pre-Order since it was announced in 2015 though, so that isn’t a mistake, but the release date is. Newest Info on FFVII:Remake, posted today. Surprised this site isn’t already on it. Nothing groundbreaking, just the fact that Nomura’s talking about it is enough for me though lol.